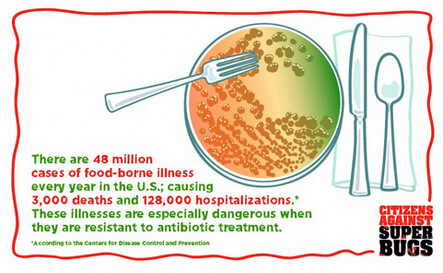 So what can you do to help stop the misuse of antibiotics and prevent the growth of superbugs? Be a responsible consumer: Purchase meat, poultry, milk and eggs from companies and farmers that don’t routinely feed their animals antibiotics. Cut down on your antibiotic use: Don’t take antibiotics unless you actually have a bacterial infection. Antibiotics won’t help a cold or virus and taking them for illnesses they can’t treat helps contribute to antibiotic resistance. Support the FDA’s proposed rule to limit the use of cephalosporins in food production — and let them know they should do more by commenting on the page. Spread the word: Tell all your friends and family members why you oppose the misuse of antibiotics in food animals — and why they should too!